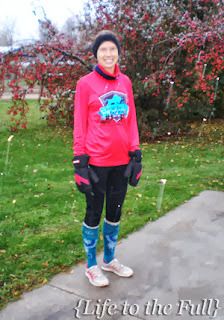 Last Saturday's run was beautiful yet chilly with a light snowfall - notice the flakes that look like mini-comets in the picture - and my first real run since the marathon. Fall has to be the shortest season ever in these northern parts. One day, a run can be hot, humid and sweaty. Then, a few weeks later, it will be cool and rainy, or even snowy! I've been asked a few times about running through the winter and figured I would explain my winter strategy. Clearly, my approach to winter running is function over fashion (notice photo at right?). My running shorts just weren't going to do it for me this morning. I do slightly resemble a rodeo clown, but I was warm AND I was running out on the country roads by my parents farm and I doubt many saw me! Layers are great for winter running because you can add more or subtract them to adjust to the temps all winter long, though it does add to the laundry loads. Keep in mind that you're going to warm up while running. Active.com suggests dressing for 15 to 20 degrees warmer than the actual temp. If you dress too toasty, remember your sweat is going to freeze and that's just no fun. Personally, if it's 40°F or warmer, I'll wear shorts - though, I keep a close eye on temp + wind chill. If it's colder than 40°F, I dig out the running tights and, for style points, sometimes I will wear a pair of running shorts over them. Wear a hat, headband, or stylish bomber hat to retain body heat. Typically, I wear a cap on my head and a headband around the lower half of my face. 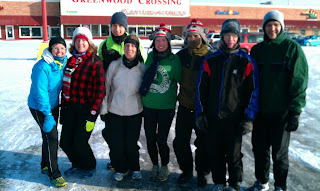 Our running group's "Ugly Sweater Run" for New Years 2013! The group was very dedicated because it was easily below 0°F and windy! Try to find shoes that will have traction in the snow and on icy spots. Last winter, I ran with trail running shoes and that did the trick. Some runners also use ice cleats on their running shoes. I'm looking into a pair of Yaktrax because my minimalist running shoes won't do too well on the ice this winter! All ready for a Fall jogger ride! In the cool months, I run in the dark while the guys are sleeping unless I can take out the jogging stroller with weather shield later in the day. Once the true winter temps set in, the jogging stroller will have to retire until spring and I'll stick to early morning runs. When running in the dark, make sure to wear reflective and/or bright clothing. Running with a hand light or headlamp helps you see and helps cars see you. I use a small headlamp we had in the house that I wrap around my hand. This is really personal preference. Some runners say it's never too cold for running, others say winter running is crazy. My general rule is that "too cold" means colder than -10°F but this depends on the wind chill. Even a windy 30°F run has potential to be miserable! For longer winter runs, I will break them into shorter chunks and loop by home more often. or just take a break from running? I have just been thinking about this. I recently got a treadmill so I know I have a back up if it's too cold out. Thanks for the tips! Nice! What kind of treadmill did you get? I'm hoping we can get a treadmill one day in the future and want to start researching the different kinds :) I thought it would be nice when there are more kids running around; you can run, but still keep an eye on the little ones. Great tips! I just got some cold weather gear - a headband, warmer running socks, a head lamp, and some long sleeve tops. I usually do a combination of treadmill running during the week and outdoor running on the weekends when I can drive to nice spots. I live off a major state route. I've never been a runner nor really an athlete of any sort. I work out and after each pregnancy I've seen the best results when I add jogging/running to my routine. I'd like to start running after I have my third baby but I'm worried about having the time and energy to do it. Any suggestions? I only have one baby as of now, so can't relate as a mom of multiple kids, but I can tell you what works for me! For me, I need to workout in the morning before my husband and son get up, otherwise it just doesn't happen! My son is sleeping a bit more regularly at night now, so I workout at 6 a.m. these days and get back in to make breakfast at 7 a.m. It's working well now with my husband's more regular winter work hours! The jogging stroller is nice for running outside, too, when the weather is nice. It seems like there is SO much gear out there for running in all weather. I was contemplating getting some warmer pants as I wear plain lycra yoga type pants right now and I'm already feeling my fatty areas get cold. It makes me nervous to run in the dark even though I take my dog with me. I'm considering getting some pepper spray or something. Maybe I'm just afraid of the dark.... Thanks for the info! !